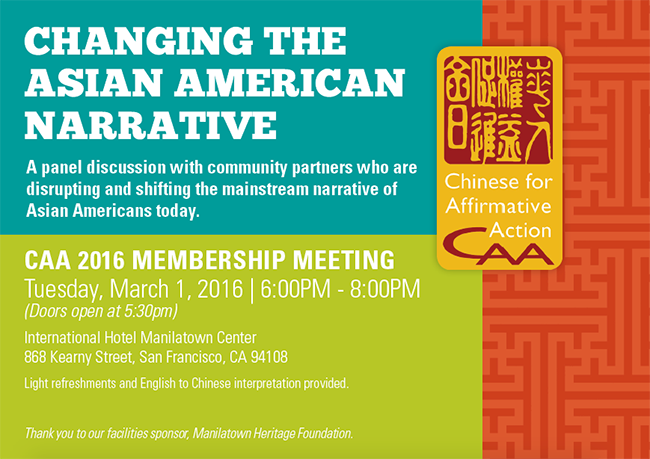 The meeting will feature a moderated panel discussion featuring CAA staff and allies who are working at the leading edge of community issues and shifting the narrative on what it means to be Chinese American and Asian American. The panelists will discuss the need to reveal and reshape a more inclusive narrative of Asian Americans including those who have been marginalized. Important organizational updates will also be provided by the staff and board. Light refreshments and English to Cantonese interpretation will be provided. Childcare can be requested by calling 415-274-6750. The event is open to the public. Admission is free for CAA members; suggested donation of $50 to become a member or to renew your membership. Membership is not required to attend the event, but your donation helps to support CAA. Thank you to our facilities co-sponsor, Manilatown Heritage Foundation.